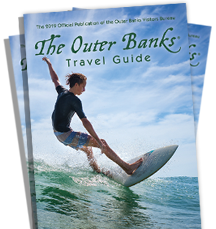 Hatteras Island is a natural environment which provides a playground for water sports of all kinds and related activities. WaterBoy provides the enthusiast with equipment to take full advantage of one of America's most popular recreation spots. With over 70 miles of unspoiled beaches for swimming, sunning, ocean kayaking, surfing, stand up paddle boarding, body boarding, skim boarding, boogie boarding and exploring, WaterBoy has all the recreational equipment you need to enjoy it to the max. On the sound side of the island, there are miles upon miles of pristine waterways teaming with wildlife just waiting for you to explore. Waterboy has kayak rentals for the novice as well as for those who are experienced at the sport. If exporing Hatteras Village by water is not your thing then WaterBoy has golf cart rentals that allow you to leisurely ramble about this quaint historic community. Give us a call to reserve your recreational equipment at 252.986.2222.